This Phone is not a VOIP Phone(Voice over Internet Provider), customers who use this phone as a VOIP will most likely have problems. A standard phone line is required for designed performance. The New Picture Care Desktop Phone FC-0613 brought to you by Future Call is the newest picture phone model that makes sense. 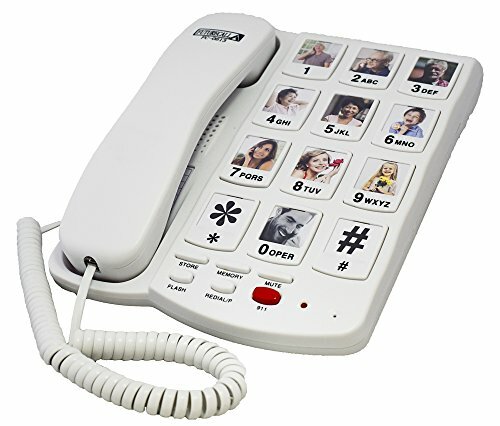 This phone has all the features that our previous picture care model FC-1007 has, including the ability to place pictures on buttons for ease of memory, 10 two-touch or 10 one-touch memory keys for number programming, bright LED lights for incoming calls and a red 911 key to easily access the authorities in an emergency situation. This device includes a volume Hi/Low/OFF switch which has been relocated to the back of the phone to prevent accidental changes from happening. The FC-0613 Model has a NEW FEATURE, a On/Off switch that prevents accidental reprogramming from occurring. If the ON-OFF switch is set to the OFF position, you will not be able to store any phone numbers to your desired memory button, making any attempt to overwrite an existing programmed memory button impossible. To utilize this setting, set the ON-OFF button to the ON position to program the numbers you would like to store on the phone. Once the numbers have been programmed, simply switch back to the OFF position, which will keep your numbers permanently stored, even during a power outage. Finally, a feature that makes it safer and easier to use and prevents changes or mistakes from being made once the numbers have been stored. Another feature added to this new model, which you will find helpful, is that all the buttons have been moved to the back of the phone to prevent accidental changes and the red 911 button is re-programmable if needed. This phone is only for desktop use and is not made to hang on walls. This picture care phone along with other picture care phones do not include an answering machine or message feature. NEW FEATURE: This 2018 Model includes all the features that the FC-1007 has, however the FC-0613 has a new exclusive feature. The Phone Number Store ON-OFF Switch(located on the back of the phone), Prevents memories accidentally being erased or changed; giving your stored phone numbers the protection that they need. The only picture care phone of it's kind. PLEASE NOTE: Memory Dialing is enabled when the New Feature is in either the ON or OFF position. However when the New Feature is positioned in the ON position, standard dialing is disabled. In this mode, a loved one can not reprogram the memory buttons without first turning this new feature back to the Off position. All previously programmed memories in either mode are safe and secure forever unless changed manually. The RED 911 Button can also be reprogrammed. BRIGHT LED LIGHTS for incoming calls, Redial / Pause Key, Flash Key for Call Waiting, FCC Approved. Ringer Volume has options of Hi / Low / Off; Handset Volume Control VHI has 2 settings of Hi / Low, Handset Recieving Volume gain has a max of 40dB. Receiving tone gain is +/-10dB, Speech volume gain is +/-3dB, and is Hearing Aid Compatible. PURPOSE OF THIS PHONE: This phone was primarily made to help the elderly, those with dimentia, alzheimers, hearing disabilites, special needs and has also been proven to be excellent for young children. This phone is for desktops only as it is not designed be hung on walls. It is NOT A VOIP PHONE (Voice over Internet Provider) and will not work correctly if connected to a VOIP Line. It does not include Caller ID nor does it have a built in voicemail. If you have any questions about this product by Future Call, contact us by completing and submitting the form below. If you are looking for a specif part number, please include it with your message.